Leopold's Crate: Fun activity for dogs who like to "disembowel" their stuffed animal toys. 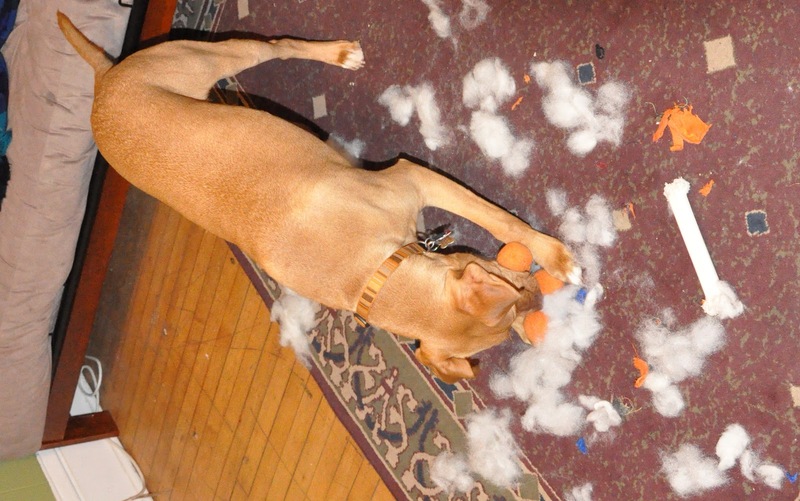 Leopold has always liked to "disembowel" his stuffed toys. I used to stop him before he could completely ruin them and then repair any damage done. The toy you seen in the photo was repaired probably ten times before I gave up and let Leopold do what he really wanted to do: tear every piece of stuffing out! What a mess. But at least he had fun. 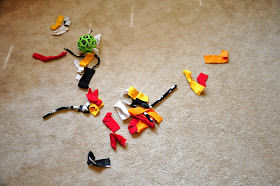 Since then I've come up with an activity for Leopold that works with the same general principle (tearing out stuffing! ), but is re-usable and easy to clean up. This is not an activity you want to give to a dog that is prone to swallowing pieces of fabric (or other things they shouldn't be eating for that matter!). This is an activity I would never give to my other dog, Halo, as she thinks fabric is delicious and likes to eat it. 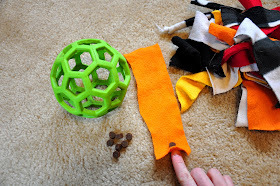 Though remember that it's always a good idea to supervise your dog when it's playing with toys (especially when its playing with pieces of fabric). 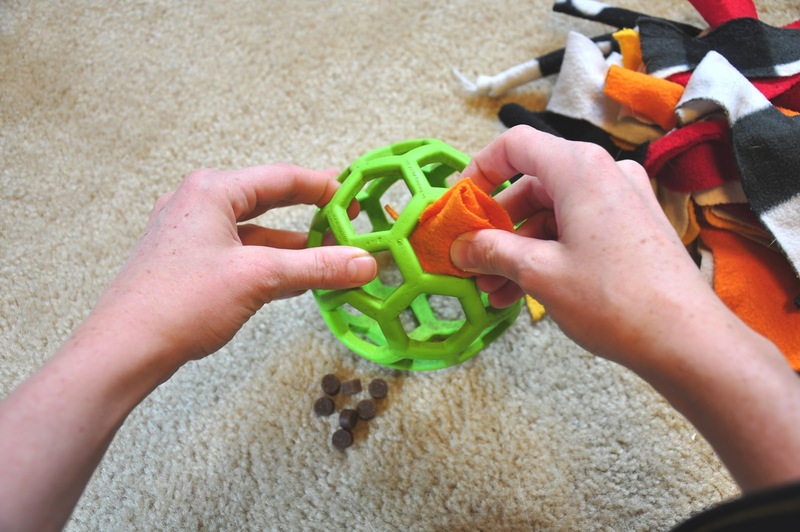 - Hol-ee Roller Dog Toy, 5"
- a dog who loves to play! I like to use the Hol-ee Roller because it's very durable and doesn't do a lot of damage if my dogs accidentally whip it at something. For a game I like to give my dogs that uses a smaller version of the Hol-ee Roller ball, check out this post. I use fleece fabric because its a thicker fabric and is also washable! I've cut my pieces into various sized strips. 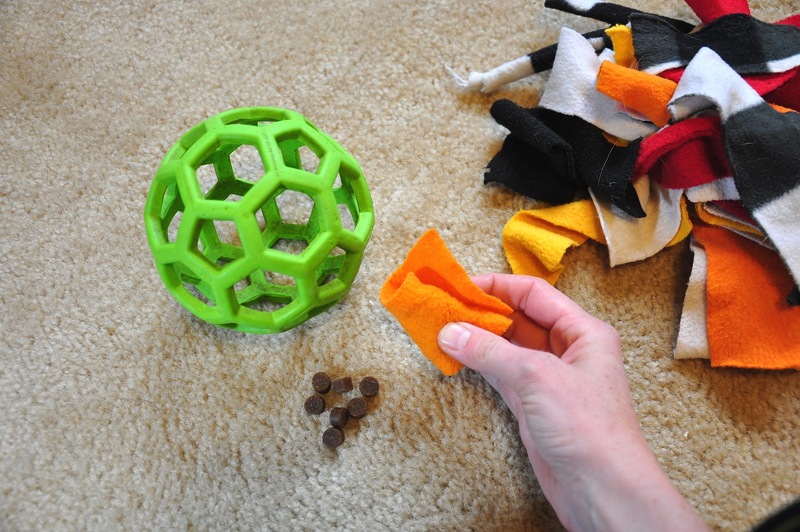 Stuff the ball with the pieces of fleece! 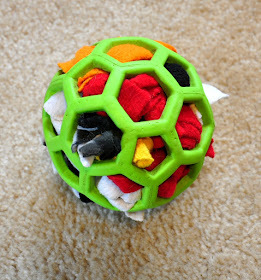 Then stuff some treats in the ball. You don't have to add treats, but it can help make the game more fun for the dog. I like to actually roll up small treats in some of the pieces of fleece. Then Leopold is not only more interested, but because the treats are rolled up in fleece, he has to work a little harder to get the treats--this is good mental stimulation as it requires Leopold to figure out how to manipulate the pieces of fabric to get at the tasty bits. 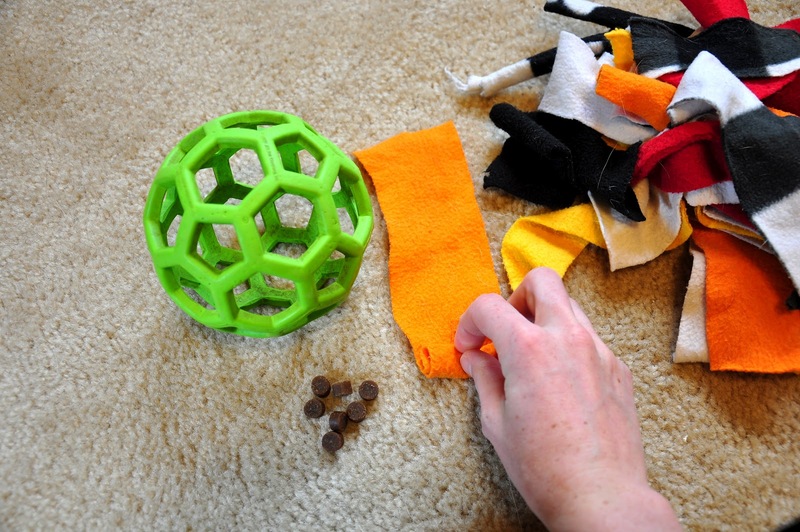 Want to get started on making your own dog a stuffed Hol-ee roller ball? [Edit, Jan2014: I put a warning at the beginning of this post, but here it is again in different words. Hope your dog has as much fun with this game as Leopold does! I absolutely LOVE this idea. I'm definitely bringing this to the attention of all my foster and rescue friends. I'll put it on my blog too (linked) if that's okay with you?! My little Shitzu Maltese..six pounds..chewed through the ball...Wahhhh..I need an indestructible one. Any ideas? 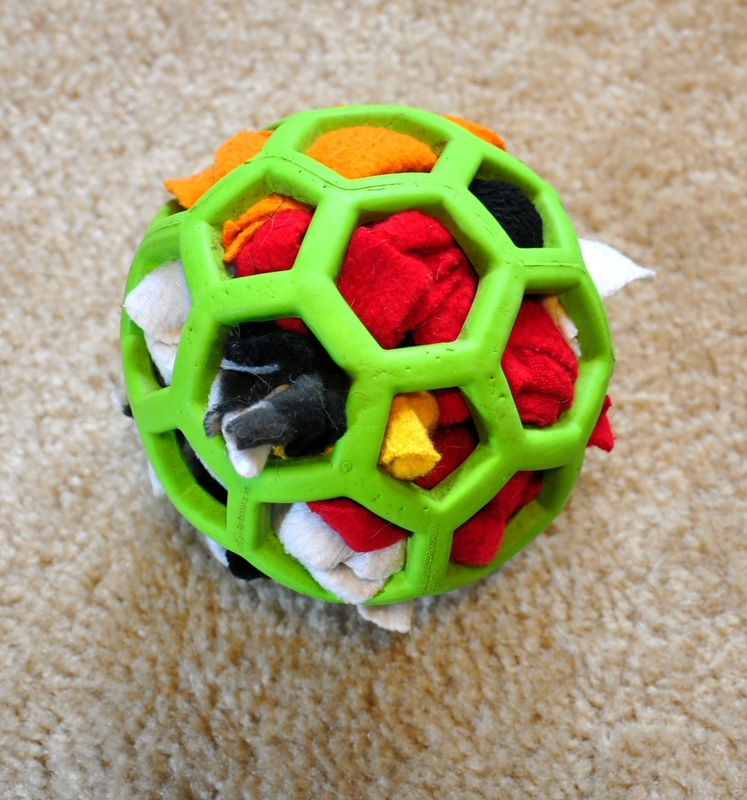 I recently got one for my dogs--they love it just as much as the Hol-ee Roller. It only comes in 5", though, and might be a little big for a 6lb shitzu maltese. But then again, maybe it'd be perfect. Love this and shared it! Creative idea. My dog is more likely to eat the strips of fabric. Flatcoated Retrievers have been known to eat socks, pants towels etc and they get stuck in their gut. Then it is a costly trip to the veterinarian to get the eaten object removed. So this would need to be monitored to ensure the dog does not eat any fabric strips. Aw, yes. Your dog would fall under the "warning" I stated early in the post, and this activity would not be recommended for your dog at all. And you are correct: just as I said in the post, it's smart to always monitor your dog while it partakes in this activity no matter if your dog is likely to eat fabric or not. I have a JR and she has disemboweled just about everything ... :( She takes squeakers out and ..just about any stuffing there is. This looks so much safer. I would dearly love to buy her one. I don't think the eating of the fabric would be an issue for her...she would hone in on the treats for sure! But I would supervise her at all times. Please ...where ... here...take my money! This is genius! I'm going to adapt it for my rat - he LOVES treats and he loves pulling fabric out of things, so this looks like a great way to keep him entertained and stimulated! I've had pet rats before as well and am imagining a rat playing this game; such a cute mental image! They're such a fun pet to have--smart creatures. I was just about to order some Hol-ee Roller for my stock range - I was wondering if you would mind if I used your photo and/or video to illustrate its use. and thank you for asking! Yes, you may use my photos/video; I'm happy to get the word out! Though I would appreciate if you credited my blog. :-) Thanks! Great solution for our Molly! She unstuffy all her toys, especially if it has a squeaker!! Can't wait to make her one of these!! Thanks for sharing. wonderful and very clever idea-I have a Boston that can and WILL destroy a stuffed toy in a nano second!!! This may be the most brilliant thing I've ever seen! I make Roxie tug ropes by braiding fleece and she loves it, never thought of stuffing it for her to disembowel! I love this! Brilliant. I have a pittie who makes a god forsaken mess with all his toys! I'm making one tomorrow!!! Also, I'm linking to my facebook page!!!! I'm so happy I found this post! I originally saw your photos on Pinterest, but it didn't link back to anything- it took some creative Googling to get here. 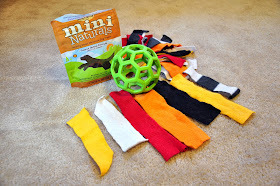 I just made this for my dog and he LOVES it- I'm so happy I can accurately credit your blog instead of a random Pinterest post! I volunteer at a zoo and am always looking for new enrichment ideas. I will be doing this for many different animals. Same problem here, cannot give our E. Setter anything with stuffing - wasted money! So this looks like a great idea! ***WARNING*** I thought this idea was wonderful for another meal dispensing toy for Cash the Pit Bull. I thought it would be economical as well as great for him in many ways. He has NEVER been a dog to eat anything but food! 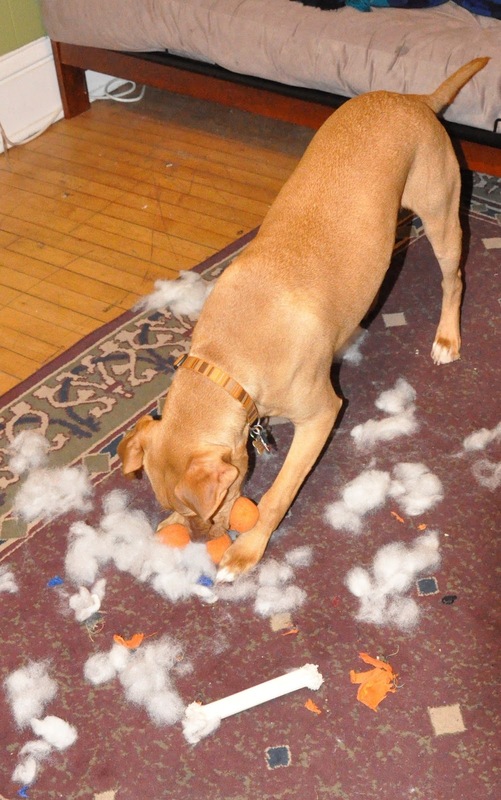 All disemboweled toys end up with their shredded remains all over the house. I gave him his meal with this setup twice already, watched him closely, and was very satisfied that he was opening each roll to remove the kibble. Tonight, I saw him chewing something in a funny way when I gave him this toy. I told boyfriend I was concerned he swallowed one of the fleece rolls with the food inside. Boyfriend thought I was crazy since he also knows Cash only swallows food things. We watched closely and saw a fleece roll go into his mouth and not come out. We rushed him to emergency vet, where they induced vomiting, and he threw up 10 FLEECE ROLL PIECES!!!! No idea how he slipped this many in without our seeing. Our best guess is he thought he was super smart and thought that he'd save himself a step by swallowing the whole things instead of picking out the kibble. 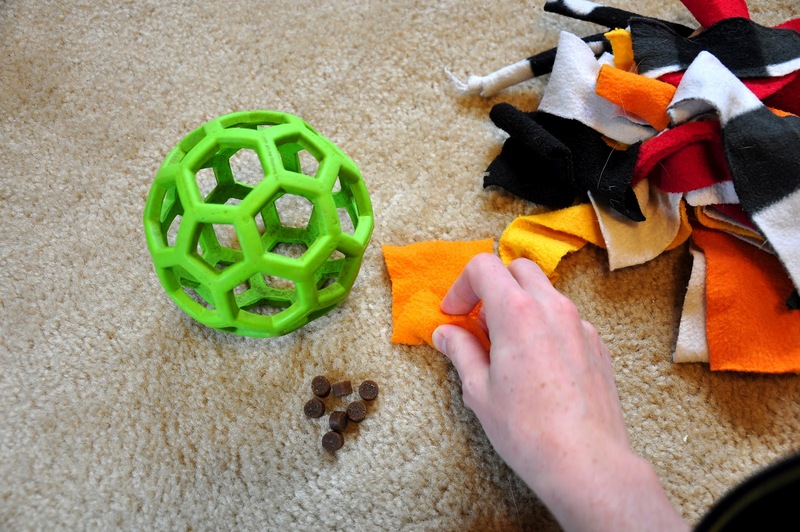 Even if you trust that your dog doesn't eat stuffing, DO NOT ROLL FOOD FOR YOUR DOG IN THIS TOY!!!! The vet thinks he threw up all of the pieces, but she isn't sure. If there is a blockage, I have no resources left financially, and it is going to be a very bad situation. I'm so sorry that your dog decided to "save a step" while trying to get at treats, and i'm sorry you didn't notice it happening until it had eaten 10 pieces! At least you noticed, though, and were able to get your dog to the vet to induce vomiting to bring those pieces up. As someone who works at a Vet ER and who owns a dog who will regularly eat fabric/leather/anything if not supervised, i know it can be a scary, serious, and expensive experience. I'm sorry to hear you had to go through such an experience. As it says in the warning on this post, its always a good idea to supervise your dog whenever they're playing with any toy--especially anything made of fabric (whether a stuffed toy, fleece pieces, or otherwise.... ). I supervise Leopold every time I give him this activity--even though he's never eaten anything but food. For that matter, I supervise my dogs whenever they're playing with any toy that they could potentially swallow--whether on purpose or on accident. Your experience is an unfortunate reminder of why it so important to supervise your dog. I hope others will be reminded to supervise their dogs as well. what a great idea. thanks for sharing this.. This idea inspired me to purchase the XL holee roller for my tortoise! I had been trying for months to come up with a hay rack for his enclosure on which he would not injure himself. He has scars from trying to get through a wire fence to get some grass. All hay racks are either metal or very breakable plastic (he has managed to break plastic plates and a pyrex pie plate!). I tried cardboard boxes with a small hole cut in it, but after a few weeks he figured out how to destroy them and I was having trouble keeping boxes in stock. It took him a few weeks to figure out how to use his new "hay ball" but now I simply stuff it every morning before I go to work and it's empty when I get home. He loves it! He can bite it, climb on top of it, knock it around. He knows when I pick up his ball it's breakfast time! I have a soft spot in my heart for tortoises and turtles. I someday hope to have a good set up to have a tortoise of my own; I'll remember your "hay ball" idea when that day comes! Very Nice idea! A love your blog I will also try it for once. Thank you so much for the post! I am constantly trying to find toys that my Golden Doodle, Onyx, won't tear apart in a ten minute time frame. I especially hate cleaning up the mess of stuffing I find all over my house. This is a great idea!! We just made one of these for our yorkie mix and he loves it. We would buy nice little toys for him and he would destroy them in less than a day taking the squeaker out and all the stuffing. This keeps him buys for hours. Well and us too. LOL. Thanks for the idea. Thanks for the fantastic idea! I just put together one of these for our new Samoyed that we adopted just about a month ago. I can't wait to see if he likes it! He sure does enjoy dis-embowling certain toys but is always so fastidious not to swallow any of the fluff or fabric. One suggestion though - I would highly recommend that you not use fleece around pets or children. Not many people know this, but fleece is prone to not only catching on fire quite easily, but also exploding. It doesn't take much heat at all to make this happen. When exposed to heat, fleece fibers will literally explode, sending hot molten shrapnel everywhere. When that molten shrapnel lands on skin, it causes the worst possible burns because it melts onto and into the skin. It's really, really horrendous. Personally I can't believe anyone even sells fleece products for children or pets. I've seen how it explodes and the burns it can cause. It's not pretty! They've tried to make it okay by soaking a lot of fleece products in all sorts of fire-retardant chemicals, but most of those chemicals don't last beyond a few typical household washings. Anyway, for our holee roller ball we cut up old cotton knit t-shirts that were falling apart. T-shirt knit works really well cause it's still easy for a dog to grip, easy to cut up into strips, and it won't fray too quickly. Just a thought! hi Heather. Thanks for your comment! I do know that polar fleece is made of synthetic fibers and will melt if exposed to flame, but I've never heard of it exploding before! I'm having trouble finding information online to verify-- do you have a link you could send me with information about this phenomenon? I'm very curious as I occasionally work with fleece in some of my art projects and safety is important to me. I love the idea of using old t-shirts for this activity! It gives the them one more purpose before they get tossed. How did the t-shirt strips hold up over time? I'm trying this tomorrow for my dog who's suffering from superstation anxiety after a move. She's super good driven so I think she will like this. I couldn't find fleece but I did find some microfibre clothes to cut up would that still be okay? I don't see why that wouldn't work. Lemme know how it goes! My Gracie is a champion toy dis-emboweler! I used this basic idea but cut the strips about 10" long, wove them through the ball openings, double knotted them in place, then stuffed the ends inside. There's still the fun of pulling the strips out, but they don't end up all over your floor, and hopefully don't get swallowed either! What a clever take on the idea! Thanks for sharing. I live in Spain and I've just discovered this post and this wonderful idea. Do you know where can I buy the ball? I'm so glad you like this idea! I'm so sorry for the slow reply; Life has been getting away from me lately. 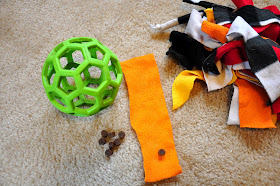 Hi Laura, I run an in-home dog boarding and training facility on Long Island, N.Y. Home Instead of Alone, Inc.)and I am always repairing toys until I deem them 'unrecognizable'.... and eventually throw them away! My own personal dog is a very firm believer that the stuffing in every toy is a manufacturer's defect, and it is his personal 'job' to right this wrong!!!!! I have since switched to buying the 'Skinneeeez' stuffing-less toys, and interactive treat-ball toys. But even then, the replacement treats do get pricey for my lovable power-chewer!! Needless to say, I spend a fortune constantly replacing toys! I thought this was a brilliant idea you came up with and I am very excited to try it! After I see how my boy does with it, I would like to add your link to my company Facebook page, as I am always offering my clients and friends fresh ideas to try! I hope that is okay with you!! Thanks for thew wonderful new idea!! Owner, Home Instead of Alone, Inc.